A Tax Credit is Better Than a Deduction! You can reduce your Arizona taxes by $1 for every $1 you donate. With a tax credit, you can get up to $1 back for each $1 you donate! If you file jointly as a couple, you can get up to $800 (donate using PayPal). Do I have to itemize my state tax deductions to take a Charitable Tax Credit? No, but you’ll need to file the first page of Arizona Form 321. (Page 2 is for donations from previous years). Where can I get a copy of Arizona Form 321? The updated form for the previous calendar year usually is available in January on this Arizona Department of Revenue website page. The form for calendar year 2017 is here. Can I file for education and other tax credits, in addition to the Charitable Tax Credit? Yes. The total amount of credit you can take will depend on the amount of state tax you owe. What’s the deadline for the Charitable Tax Credit? You can donate as late as April 15** and take the tax credit for the previous tax year. However, if you also want to deduct the contribution from federal taxes, you must make the contribution in the same calendar year (by December 31). What’s the Working Poor Tax Credit? It’s the old name for the Charitable Tax Credit. It was changed several years ago. 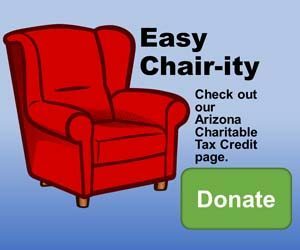 The Arizona Department of Revenue provides information on the Charitable Tax Credit and other credits on the AZDOR website. * For the best information pertaining to your tax situation, please consult your professional tax adviser. ** April 15 is normally the deadline to file taxes. In some years, the deadline may be later because of weekends and federally recognized holidays. It is April 17 in 2018. We accept contributions online through PayPal. You do not have to register with PayPal if you are using your Visa, MasterCard, Discover or American Express Card. Not ready to give today? Please fill out this Pledge form and we will send you an electronic or paper invoice in December. Bridging AZ Furniture Bank is a Federally recognized 501(c)(3) Nonprofit Organization. All contributions are tax deductible.